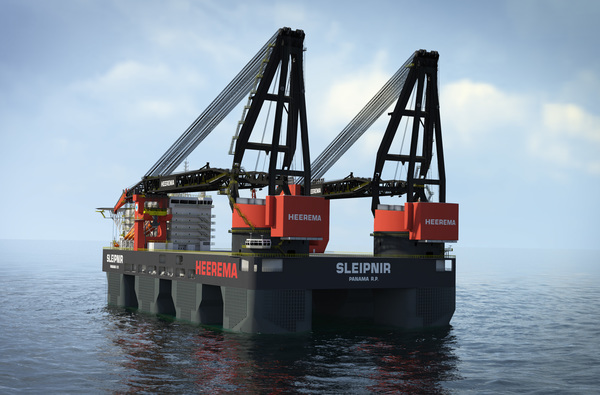 HMC is currently developing a new generation semi-submersible crane vessel: Sleipnir. 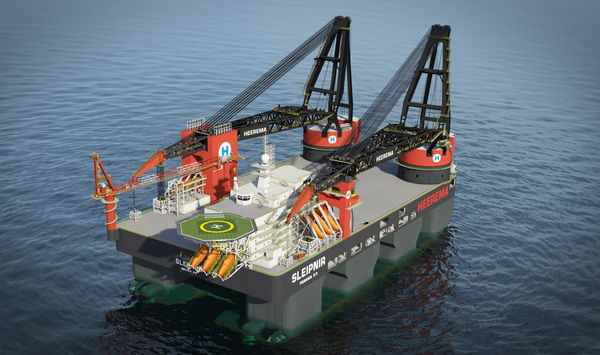 The Sleipnir is designed for worldwide offshore heavy lifting. 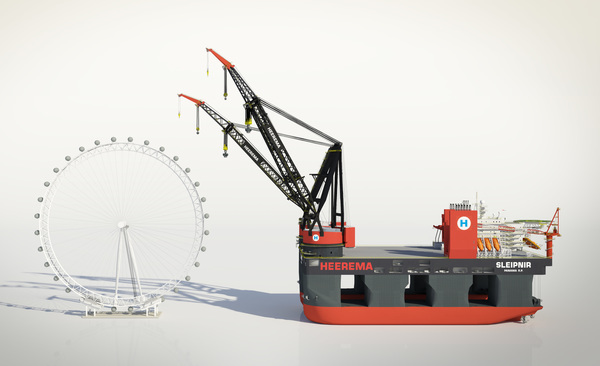 It will be equipped with two cranes of 10,000 metric tonnes lifting capacity each and a reinforced deck area of 220 meters in length and 102 meters in width, which will make it the largest crane vessel in the world. The dual cranes provide for heavy lifting capacity both to install and remove jackets and topsides. Furthermore, the cranes can be utilized for installation of foundations, moorings and structures in deep water. The Sleipnir is self-propelled with a minimum service speed of 10 knots, with power generated by means of dual fuel engines – MGO & LNG. Station-keeping is by means of dynamic positioning (DP3) or mooring system. The living quarters are equipped to accommodate 400 men in single and double cabins. All quarters have heating and air conditioning facilities. The helicopter deck has a diameter of 28 m and a load capacity of 15.6 mT. It is suitable for an Augusta Westland EH101 or a Sikorsky S-92. Sleipnir will be equipped with nine free-fall lifeboats with a capacity of 70 persons each, divided over three lifeboat stations (three lifeboats per lifeboat station). IMO equipment Class 3, Lloyd's Register DP (AAA). Forward end - Four (4) retractable, underwater demountable fixed pitch, variable speed azimuth thrusters of 5.5 MW each. Aft end - Four (4) underwater demountable fixed pitch, variable speed azimuth thrusters of 5.5 MW each. Stevpris Mk-6 anchors of 12 t each. 96 MW total main power plant, consisting of 12 engines of 8 MW each, divided over four engine rooms (three engines per engine room). Compliant to IMO Tier III requirements.